This is a custom recovery based on Cyanogen's recovery source with a lot of things added by me. The purpose of this recovery is to avoid using adb by accessing all features directly from the menu. Use the trackball (up+down) to navigate through the menu, press the trackball to select items. Use the Volume-down key to go back to a previous menu. Always check recovery.log before posting your issues! 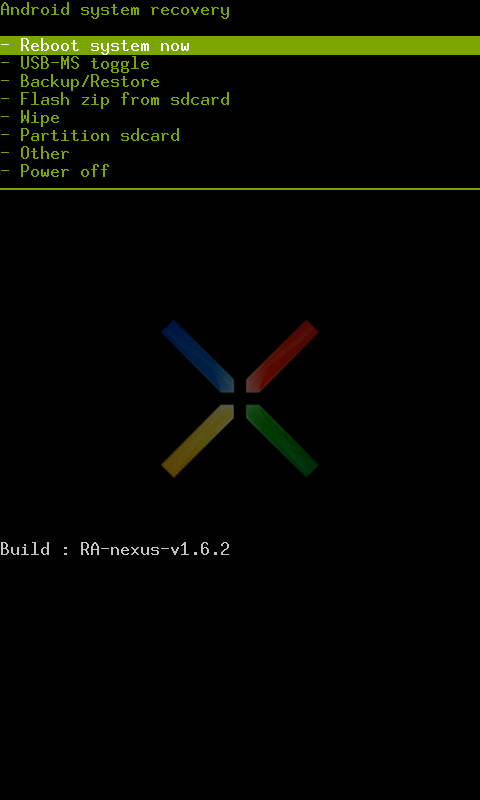 Nandroid v2.2.1 : enter "nandroid-mobile.sh" to start. BART v1.0.1 (Backup and Restore Tool) : enter "utility" to start. switchrom.sh V1.1 : enter "switchrom" or "u" to start. sdparted v0.6 : enter "sdparted" to start. - unlocked bootloader : How to unlock the bootloader. - root access : Modaco's superboot. Check if there's no /system/etc/install-recovery.sh script if you keep booting back in the stock recovery (exclamation mark with a little Android). 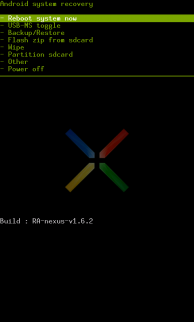 Copy recovery-RA-nexus-v1.6.2.img to a location where fastboot can find it. [*]Boot the phone while holding down the VOLUMEDOWN-key. [*]Navigate to RECOVERY with the the VOLUMEDOWN-key. [*]Press the POWER-key to select. ALWAYS check the md5sum to make sure the zip isn't corrupted. [*] New unyaffs binary patched by Koushik Dutta and Packetlss to fix the "losing root"-issue and incorrect file-time after a Nandroid restore. [*]Cyanogen for his dedicated work! , buy him a beer! [*]Bkmo for his utility script! [*]Devsk for his switchrom script! [*]51dusty for his sdparted script! [*]k4str0 for his fix_permissions v2.03 update. [*]rikupw for the ideas and toggle_ums script. omg that was really quick! cheers Amon_RA! Great job on this one... Amon_RA ur the king of recovery images!!! You sir are a hero! Thanks a lot Amon_RA... that was fast. one question.... can I permanently flash the image using Flash_image command. Once your rooted you can flash it permanently several ways. But make sure to do the superboot first. 'fastboot flash recovery /path/to/good/recovery.img' after I superbooted. I noticed before I superbooted that I was going back to stock after another reboot. thanks for your reply . I have a question, how do I do a superboot. Hold the volume down button and hit the power button (while holding the side volume down button). You should see the bootloader screen (with the word unlocked on top). Devices: Dell Streak, G1 and Galaxy S! How do I enter Amons recovery after flashing it? many tks anyway and my compliments for your work !!! Can anyone confirm if the nand backup includes the system/lib dir? I used unyaffs.exe on my system.img backup and the lib dir was not extracted, i wasn't sure if it's unyaffs failing or the nand backup? Hi, i did all above, but now while pressing the power button and the track ball gives me the "old" bootloader. EDIT. I think i found it. You need to enter RECOVERY from the menu. I have a stock Rom from Paul, but I've flashed this excellent recovery image - Do you have a stock recovery that I can flash back to stock with? I know the stock recovery still has an Apply Update.zip option so was going to change the recovery back using ADB, then flash the unrooted stock ROm and should be all good - Hope you or someone can help. Brilliant stuff and I will be flashing your recovery back onto my new nexus hopefully when it arrives. Is it just me or the 1.5.3 Amon_Ra doesn't have the ext2 -> ext3 -> ext4 options? someone can help ? is there a zip with originale rom somewhere ?